In this article we offer an in-depth, side-by-side comparison of the Ergotron WorkFit-T and the VARIDESK Pro Plus 36 height adjustable standing desk converters. The price difference between these two standing desk options is negligible, and the customer reviews for both the Ergotron and the Varidesk products are consistently high. To help you make your choice, here is a side-by-side comparison of both products in every category that matters, so you can quickly and accurately compare Varidesk vs Ergotron and choose the standing desk converter that will be best for your application. To start, here's a top-level comparison between the Ergotron and Varidesk products. We'll get into more detail on some of the differences between the Varidesk and Ergotron below, but this initial look reveals some pretty significant differences which might help you make your decision right here. A smaller footprint (it will free up space on the rest of your desk). If you set price (comparable) and brand name recognition (advantage Varidesk) aside, it seems that the Ergotron WorkFit-T will be the better choice, but let's dig deeper to be sure. The Ergotron has the capacity to lift an additional 5 pounds without effort from you. This is a bigger deal than it sounds, especially when you consider the weight difference of monitors and monitor mounts when you're building your ideal multi-monitor setup. You can add more, or larger monitors to the Ergotron. The Ergotron lifts vertically and not forward (see images below). This has the advantage of a reduced risk of tipping your expensive components, while also allowing you to stand closer to your physical desk (important for small spaces). One thing we considered when evaluating this key difference in user positioning to his or her desk was if standing farther from the workstation had any ergonomic or eye-health benefits/drawbacks. The answer is, not really. According to OSHA.gov, your eyes should be 20-40" away from your screen in an optimal workspace, and both the Ergotron and the Varidesk will allow you to be in that range. In terms of the footprint of each product on your desk when collapsed, I feel the difference is negligible. The Ergotron does occupy less space on your desk, and can be used comfortably on desks which are not as deep as the Varidesk, but when I tried these products, I liked both equally in this regard. When comparing the keyboard tray of the WorkFit-T and the Pro Plus 36, Varidesk has a clear advantage. ​The Varidesk product has a keyboard tray which extends the full width of the product, offers an ergonomic curve in the front, and is much deeper, offering a superior amount of work space and comfort. ​For most people, the Ergotron's keyboard tray will be adequate, but if you have a large keyboard and peripherals or just like the feeling of having space front-to-back and side-to-side, you'll be happier with the Varidesk. Most people will recognize the VARIDESK brand name more readily than the Ergotron brand name, which is a pretty good endorsement for the value of television advertising. But the Ergotron brand is one you should know - it has been around since 1982 (VARIDESK was founded in 2013), and has a number of successful, well-regarded products in its portfolio ... some of which may already be in your home holding up your television or computer monitors. If you're on the fence about going with a "no name" brand vs. one you recognize like VARIDESK, don't be. Ergotron is a well-respected brand with headquarters in the USA. They have been manufacturing quality products for over 35 years. 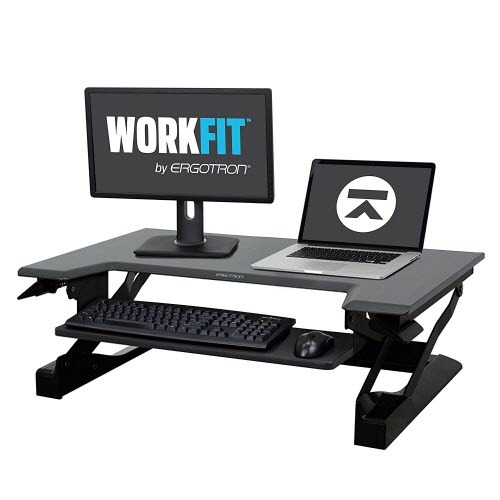 The 35" Ergotron WorkFit-T and the Varidesk Pro Plus 36 are comparably priced (within $10 of each other). The Varidesk is a slightly wider unit, and tends to be the (marginally) less expensive of the two, so you're getting more standing desk converter for your money if you buy the Varidesk. But in my view, the price should not determine which desk riser you choose between the WorkFit-T and the Pro Plus 36, because they cost virtually the same amount. If you're looking for a less-expensive standing desk converter that doesn't sacrifice quality, I can recommend the 35" Flexispot M2B. It is generally available on Amazon for about $150 less than these products, and I was very impressed with the quality of it when I trialed it for 100 hours in my home office. For me, it combined the best qualities of the Ergotron and the Varidesk. You can read my in-depth review here. Design is personal, and what one person likes aesthetically may be considered ugly to the next person. In this section I'll try to point out what I consider to be the major design differences which you should consider if the look and feel of the desk riser will play a major role in your decision. Color - Varidesk offers more color options than Ergotron (4 vs. 2). Both desks are available in Black and White, but the Pro Plus 36 can also be ordered with a faux butcher block or dark wood top. They're laminate veneers, but if you're looking for something that looks more warm and less modern, Varidesk has a couple of good options for you. Desktop - The work surface and keyboard tray of both units are similar ... they're basically MDF with a high-quality, scratch-resistant veneer. The primary difference is that the Ergotron features edges that are beveled at about a 45 degree angle, whereas the Varidesk corners and edges are rounded over. I did not find one to be more or less attractive or comfortable to work on than the other. Method of Rising - I prefer how the Ergotron rises straight up from its footprint. This kept my work space occupying the same space above my desk regardless of the height of the desk. 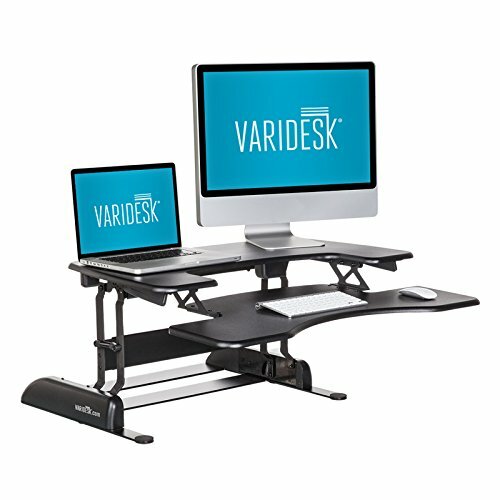 The Varidesk rises and extends forward slightly into your workspace when lifted. Both feel sturdy, but I felt my equipment was more secure on the Ergotron. Keyboard Tray - As mentioned, the keyboard tray of the Varidesk is much better in terms of its width and depth, and I preferred the ergonomic curve at the front of the Varidesk keyboard tray, which the Ergotron does not have. Should You Buy the Ergotron WorkFit-T or the VARIDESK Pro Plus 36? Unlike other standing desk comparisons I've done, the decision between the Varidesk and Ergotron is a tough one, with no clear winner. I honestly believe they are both great products that you can buy with confidence. The decision will come down to details of function and design (since they are comparably priced. From a functional standpoint, the Ergotron WorkFit-T is my recommendation. It can lift more weight and accommodate larger monitors, will rise two and a half inches higher off of your desk, and it offers 9 additional height adjustment levels to dial in your ergonomics more precisely. I also preferred how this desk riser rises vertically without horizontal movement, which made me feel that my expensive equipment was more secure on it. The only drawback to the Ergotron WorkFit-T in a comparison with the Pro Plus 36 is that its keyboard tray is inferior in terms of space. From a design standpoint, the Varidesk offers a better look with its expansive and ergonomically curved keyboard tray, sleeker lift mechanism, and additional color options. In my view each product is priced well and each is one of the best standing desktop riser products on the market.